Devin White. Credit: Derek E. Hingle, USA TODAY Sports. While mock drafts typically focus on what will happen, this mock draft will focus instead on what would happen in the perfect world for the Denver Broncos. Considering the Avs’ recent draft misfortune with the lottery, it seems like the ideal time to imagine a perfect dreamscape where players slide right into the lap of the Broncos and every pick is a home run. Round 1: 10th pick overall. Unfortunately for the Broncos, the idea of landing Devin White with the tenth pick now feels like a long shot, though, no player in the draft would be a better fit in Denver. The Broncos have been searching for a linebacker since Danny Trevathan packed his bags for the Windy City as they have consistently been burned by pass-catching running backs and athletic tight ends. While Josey Jewell has fantastic instincts and should be a solid run-stuffer, his lack of athleticism makes him a mismatch in coverage. 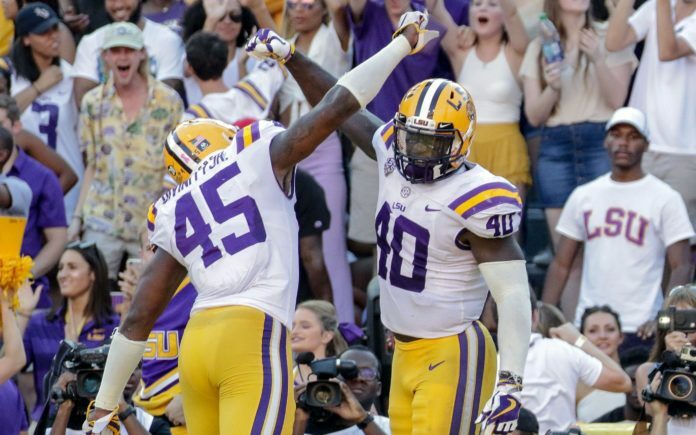 Devin White, on the other hand, is one of the freakiest athletes in the draft and should be able to hang with most anyone in coverage. 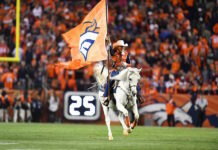 While White is an elite talent and the Broncos’ ideal pick, Denver would also be the ideal landing spot for White considering head coach Vic Fangio‘s history coaching linebackers like Ray Lewis, Patrick Willis and NaVorro Bowman. Round 2: 41st pick overall. While the Broncos’ struggles at quarterback are more apparent, the two most problematic holes on the roster now are at linebacker and along the interior of the offensive line. With White filling one of those needs, Risner would be the dream Round 2 pick. Risner could go as high as the late 20s but could still slide to the Broncos at pick No. 41. For now, Risner could play center, solving the Broncos’ interior line problems, but he has the talent and the skill to move to tackle in the future if Garrett Bolles flames out. Risner is one of the grittiest players in the entire draft, and he’s a Colorado kid that has always dreamed of being a Bronco, making him the perfect compliment to Phillip Lindsay. Round 3: 71st pick overall. Dawson Knox is a Round 2 talent, but due to the incredible depth at the tight end position in this year’s class, his lack of production in college and the overall value of the tight end position, he could easily see the third round. Not only would Knox be a steal, but he’d be the most talented tight end in Denver since Julius Thomas. There are concerns about Knox’s lack of statistical production in college, but that has more to do with the surrounding talent of A.J. Brown and D.K. Metcalf, Ole Miss’ scheme, and quarterback Jordan Ta’amu‘s inability to progress through reads. John Elway recently told NFL Network’s James Palmer that he’s been looking for a decent tight end in the draft for years; Knox would end that search. Round 4: 125th pick overall. 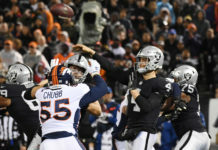 While most draftniks have connected Drew Lock to John Elway due to his size, arm strength and athleticism, Tyree Jackson fits that mold even better. In terms of size and arm talent, Jackson is nearly identical to Paxton Lynch but that’s where the comparisons end. Unlike Lynch, Jackson loves the game of football and is driven to continue getting better. Accuracy is a red flag, though he’s no worse there than Lock. Jackson is raw and would need time to sit, but with Flacco currently starting, there wouldn’t be a rush to throw him into the fire. While Jackson needs a lot of polish, the fourth round would be excellent value and there is no quarterback in the class with as high a ceiling as his. Yes, the Broncos already shored up the interior of their offensive line with Dalton Risner, but Nate Davis would be a great pick for the future. Ronald Leary has consistently been nagged by the injury and bug and likely won’t be on the team in 2020. Denver would be wise to give offensive line coach Mike Munchak a project with high upside like Davis. He may be the most powerful guard in the entire class and with time to develop could very well end up being an upgrade over Leary. 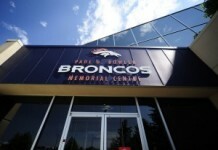 His presence would also allow the Broncos to try playing Risner at tackle if Bolles’ struggles continue into 2019. Round 5: 156th pick overall. While pairing Johnson with his college quarterback would be a bonus, there are far more reasons why the Broncos should consider him. Namely, Johnson fits what the Broncos want to do perfectly. With Flacco and new offensive coordinator Rich Scangarello in the building the Broncos will lean on the zone run game to set up deep play action passes, which is where Johnson excels. While his speed is a question mark, Johnson has elite hands and almost always comes down with 50/50 balls. Plus, with Emmanuel Sanders nearing the end of his career, the Broncos will need to add depth at the position. Round 6: 182nd pick overall. Even despite the signings of Kareem Jackson and Bryce Callahan, the Broncos need depth at cornerback. Chris Harris Jr. is currently holding out and could be elsewhere in 2020, Isaac Yiadom had a bumpy rookie season and Brendan Langley is moving to wide receiver. Plus, it sounds like Jackson could be playing safety more than corner. Kendall Sheffield is incredibly raw and often gets mixed up in coverage but has elite athleticism that can’t be taught, and in the sixth round, it’s worth taking a swing for the fences. If Sheffield doesn’t pan out as a cornerback, he has high-upside as a return man and on special teams as a gunner. Round 7: 237th pick overall. The Broncos may have the best one-two punch in the league now with Royce Freeman as the bruising power back and Phillip Lindsay as the shifty speed back. That being said, considering his size and his injury in 2018, durability is a concern for Lindsay moving forward. Williams could help add depth behind Lindsay so that the Broncos run game can keep churning even without him in the lineup. Also, with Devontae Booker appearing to be a bust, the Broncos could use another third down back to fill that role. Few running backs in the class are as willing pass blockers as James Williams who also showcased great hands and route running ability with the Cougars.